As I was writing about the possible impact of migration on our politics in this country, I was thinking about the Great Migration of approximately 8 million African Americans from the rural South to Northern cities, and the fact that the trend seems to have been reversed recently. When we discuss issues related to people of color, we tend to think of urban centers. There is a case to be made for that. 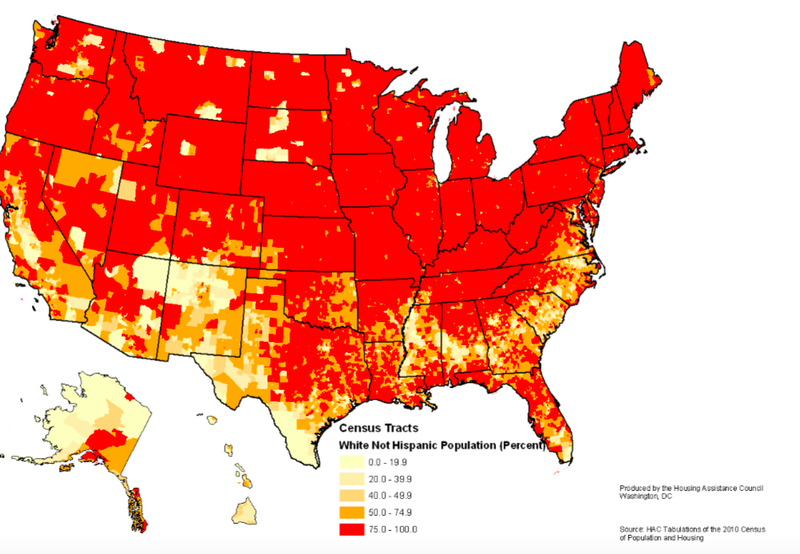 But what is striking about this map is the way that people of color are concentrated in the South, Southwest and California — including the rural areas in those states. Here’s an interesting nugget: “just under one-quarter of all rural and small town Hispanics live in Texas alone.” To build on what Kevin wrote, when we think of “rural America,” we rarely imagine Hispanics living in rural Texas. The HAP report goes on to talk about migration trends in rural America. The population in rural and small town America increased by roughly 3.5 million between 2000 and 2010. However, this population growth varied widely across racial and ethnic groups. While White Not Hispanics comprise nearly 80 percent of the rural and small town population, they made up less than one-quarter of rural population gain. One of the more significant demographic trends in the U.S. over the past several decades has been dramatic growth in the Hispanic population. 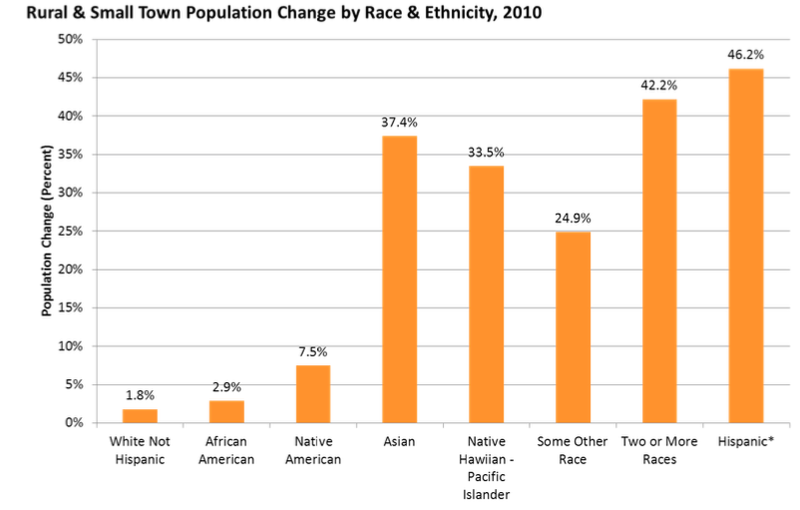 In rural and small town areas the Hispanic population increased by 1.9 million or 46 percent between 2000 and 2010. This is something I’ve been writing about since I read a report by A.G. Sulzberger back in 2011. For generations, the story of the small rural town of the Great Plains, including the dusty tabletop landscape of western Kansas, has been one of exodus — of businesses closing, classrooms shrinking and, year after year, communities withering as fewer people arrive than leave and as fewer are born than are buried. That flight continues, but another demographic trend has breathed new life into the region. Hispanics are arriving in numbers large enough to offset or even exceed the decline in the white population in many places. In the process, these new residents are reopening shuttered storefronts with Mexican groceries, filling the schools with children whose first language is Spanish and, for now at least, extending the lives of communities that seemed to be staggering toward the grave. This isn’t to say that Hispanic migration to rural American will change those areas from red to blue. Just as the Great Migration of African Americans took decades to change the face of urban America, we’ll be watching this one unfold slowly over time. The immediate political implication is that this migration tends to be concentrated and therefore has a tremendous impact on the individual small towns where it is happening. As Sulzberger and others have pointed out, how they respond to the cultural changes it brings could impact whether their towns survive. At least in parts of rural America, that is the source of some of the fear we are witnessing in the Trump era. Finally, as we saw with Kotkin and Cox, political scientists and pundits will make mistakes in their analysis when/if they continue to make the assumption that trends are primarily based on what white people are doing. As all the demographers are telling us, this country is headed towards a time when non-whites make up a majority. Any political analysis that doesn’t take that into account will be flawed.